Comprising five different zones, everything in the lab has been carefully engineered to help students in the School of Engineering become familiar with new technologies to design, develop and test their ideas. They can use the equipment to perform detailed design reviews, rehearse in-depth training tasks, validate maintenance procedures or verify assembly and manufacturing processes at 1:1 scale. They can view their engineering projects in real-time, using the latest 3D modelling and visualisation technologies. Take a 360 virtual tour of the Virtual Engineering lab. The laboratory consists of a virtual reality auditorium, a project-based learning laboratory, a rapid prototyping and post-production suite, a digital factory and a head-mounted-display suite, which allows students to navigate their engineering projects in 3D, using virtual reality headsets. The virtual reality auditorium features an ActiveWall with a 6m x 3.2m screen from Da-Lite that enables students to view their models at full size. The fully tracked system uses Intersense wireless tracking, with navigation provided by a wireless MicroTrax controller. Next door sits the head-mounted display suite, the two separated by an electrostatic glass wall that can be made opaque at the flick of a switch. 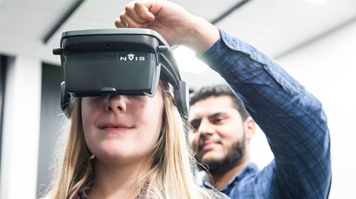 The two environments are joined by a live link so that our students can understand how the VR world is developed using high-tech physical sensor-based rigs. The project-based learning suite is home to 23 workstations running a range of CAD software from Autodesk, Ansys and Siemens, while the rapid prototyping suite has the capability to turn the solutions created in the CAD suite into reality thanks to 3D printing solutions from Stratasys, including the Fortus 360mc and the Connex Objet260. Between them, these facilities give LSBU staff and students the chance to visualise and test their design before making physical prototypes that help them to understand how their project will work, as well as spotting and correcting any design flaws quickly and easily. We’re planning to put the facility to work finding solutions in other areas besides engineering too, using VR in areas such as medicine, sports science, architecture and the built environment and applied science. Read more about our facilities for mechanical and design engineering.